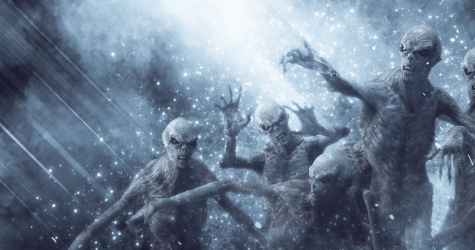 Apologetics Press - Demons: Ancient Superstition or Historical Reality? Mark 5:1-13 relates an incredible story wherein Jesus casts out the “devils” from an unfortunate man. He then causes the devils to enter, instead, a herd of swine, and the swine, thus bedeviled, race over a cliff, fall into the sea and drown. Fundamentalists would have us believe that this is a true story. That tells us a lot about fundamentalists. Belief in demons and fairies and goblins and dragons ended, for most people, ages ago, and is remembered only in some Fairy Tales. Such primeval superstitions should be left behind, in our colorful past, where they belong (Hayes, 1996, pp. 129-130). We need not argue whether demons were realities or not. One thing certain is that in the time of Jesus people believed in them with terrified intensity. If a man believes he is ill, he will be ill. If a man believed that he was demon-possessed, then, illusion or no, he was definitely ill in mind and body (1976, p. 26). The Scottish scholar went on to concede that Jesus may have believed in demons, but that “He did not come into this world to give men medical knowledge, and there is no reason to think that his medical knowledge would be any more advanced than that of the people of his day” (p. 27). To suggest that such a comment is a reflection upon the deity of Christ is an understatement. The New Testament does not represent Jesus merely as believing in demons, but depicts Him actually speaking to these beings, and being spoken to by them. He even commanded demons to do certain things. Either these evil spirits were a reality, or else the biblical record is entirely wrong. There is no other way to view the matter. This sort of a priori dismissal of the historical record is typical of unbelief. The skeptic, and even those religionists who have been influenced by the rationalistic mode of thought, repudiate anything that is not consistent with current human experience. But such an ideology simply is not an intelligent basis upon which to establish conclusions. There is validity in the credibility of historical testimony. The reality of demon activity, therefore, is not to be determined upon the basis of twentieth-century experiences; rather, it is grounded in whether or not the New Testament documents are credible. While I do not have the space to explore this matter in depth, I would like to make this observation. In 1846, Simon Greenleaf, Dane Professor of Law at Harvard University, produced a work titled The Testimony of the Evangelists Examined by the Rules of Evidence Administered in Courts of Justice. Greenleaf was the greatest authority in the history of legal procedure on what constitutes evidence. His massive three-volume set, A Treatise on the Law of Evidence (1842-53), is, to this very day, a standard on the topic of evidence. Greenleaf argued in The Testimony—with dramatic authority—that the accounts of Matthew, Mark, Luke, and John passed the strictest tests of authenticity, and thus may be regarded as dependable (1903, pp. 1-54). And without controversy is the fact that these writers described cases of demonic activity during the ministry of Jesus. The etymology of the term “demon” is rather obscure, but some have suggested that it comes from a Greek root meaning “to know,” hence probably means “a knowing one” (Vine, 1991, p. 203). Vincent noted that Plato derived the term from daemon, signifying “knowing” or “wise” (1972, p. 92). Ancient Greek writers suggested that the genesis of the term is to be found in the fact that these entities were considered to be “intelligent beings” (McClintock and Strong, 1968, 2:639). I will not concern myself with a detailed discussion of how demons were perceived in the ancient world, except to say that they were seen as evil spirits “somewhere between the human and the divine” (Arndt and Gingrich, 1967, p. 168). Unlike the speculative literature of antiquity, the New Testament makes no attempt to explain the origin of demons or to describe any materialized features (cf. Reese, 1992, 2:141). This appears to be significant; the restraint, I believe, is a subtle evidence of the divine inspiration of the narratives (see Jackson, 1996). Scholars, however, have speculated as to the origin of demons. I will consider briefly some of the prevalent ideas. (1) Some claim that demons were the disembodied spirits of a pre-Adamic race of men who lived upon the Earth in a “gap period” that allegedly fits between Genesis 1:1 and 1:2. There are two things wrong with that notion: (a) There is absolutely no evidence that there ever was a historical “gap” between the first two verses of Genesis (see Fields, 1976). (b) There were no people before Adam. He came directly from God (Luke 3:38), and was the “first” man (1 Corinthians 15:45). (2) Others trace the origin of demons to a supposed cohabitation between angels and certain women of the pre-Flood world (Genesis 6:1-6). This theory is negated by the fact that Christ taught that angels are sexless beings, incapable of such unions (Matthew 22:30; see also Kaiser, 1992, pp. 33-38). (3) It has been argued that first-century demons may be identified with the fallen angels mentioned in 2 Peter 2:4 and Jude 6, some of whom, consistent with the divine plan, were permitted to leave temporarily that sphere of confinement for the purpose of inhabiting certain people. Charles Hodge argued this theory (1960, p. 643), which probably is the most popular idea regarding this matter. (4) Another view is that demons were the spirits of wicked dead men who were allowed by God to leave the Hadean realm to accommodate the implementation of the divine plan of redemption. Josephus claimed that demons were the “spirits of the wicked, that enter into men that are alive and kill them, unless they can obtain some help against them” (Wars 7.6.3). Alexander Campbell delivered a lecture in Nashville, Tennessee on March 10, 1841, in which he, in rather persuasive fashion, argued the case that the “demons” of the ancient world were the spirits of the dead. The printed form of that presentation is well worth studying (Campbell, n.d., pp. 379-402). In the final analysis, no dogmatic conclusion can be drawn with reference to the origin of demons. That they existed admits of no doubt to anyone who takes the Bible seriously; as to their origin, the Scriptures are silent. The nature of demons is spelled out explicitly in the New Testament. They were “spirit” beings. This, of course, creates a problem for the skeptic, who denies that there is anything beyond the material. But consider the testimony of Matthew. “And when evening was come, they brought unto him [Christ] many possessed with demons: and he cast out the spirits with a word” (8:16). Note that the terms “demons” and “spirits” are used interchangeably. Since it is known also that “a spirit does not have flesh and bones” (Luke 24:39), one must conclude that demons were not physical beings. As spirit entities, demons could exercise both volition (“I will return...”) and locomotion (“Then goeth he...”) (Matthew 12:44-45). Moreover, they could assimilate factual information. A demon once spoke to Christ and said: “I know thee who thou art, the Holy One of God” (Luke 4:34; cf. Mark 1:24). Too, they possessed a religious sensitivity. “Thou believest that God is one; thou doest well, the demons also believe and shudder” (James 2:19). “Shudder” suggests to “be struck with extreme fear, to be horrified” (Thayer, 1958, p. 658). The fact is, they tremble in prospect of their ultimate doom (see Matthew 8:29). As to their character, demons are depicted as “unclean” and “evil.” In describing the vile nature of the Jewish nation of His day, the Lord gave an illustration regarding a man who was possessed of an “unclean” spirit (Matthew 12:43); the spirit left the man, but eventually re-entered the gentleman, taking with him other spirits “more evil” than himself (vs. 45). This passage reveals the “unclean” (Greek akathartos—“not pure”) or “evil” (kakos—that which not only is morally malignant, but injurious as well; cf. Vine, 1991, p. 272) disposition of demons. From this text it is observed also that there were degrees of vileness (“more evil”) in demons. The physical and/or mental effects occurring in certain individuals as a consequence of being possessed by a demon or demons (more than one could indwell a person; Mary Magdalene had once been inhabited by seven demons—Luke 8:2) were varied. Some demoniacs were afflicted with blindness and/or the inability to speak (Matthew 9:32; 12:22). Some thus possessed might be prone to violent convulsions. A case recorded by all three synoptic writers tells of a young man who was “epileptic.” He suffered grievously, frequently falling into the fire or into water (Matthew 17:15). He was dashed to the ground and bruised badly (Mark 9:18; Luke 9:39); he foamed at the mouth, ground his teeth, and “pineth away” (Mark 9:18). This final descriptive may suggest that the boy’s body became rigid so that he was incapable of motion (Arndt and Gingrich, 1967, p. 550). A demon-possessed man who lived among the tombs on the eastern side of the Sea of Galilee had excessive strength. He often had been bound with chains and fetters, but he had broken these restraints into pieces, and no one had the power to tame him (cf. also Acts 19:16). Further, he was characterized by both emotional illness and antisocial behavior (e.g., he wore no clothes—Luke 8:27), but when Christ purged the demon from the poor fellow he was observed “clothed, and in his right mind” (Mark 5:15). It is important to distinguish between cause and effect in these cases. The cause was that of demon possession; the effects were physical and/or emotional maladies. The Scriptures never confuse the two. In other words, “demon possession” was not just an ancient, unenlightened attempt to explain physical and/or mental problems. Rather, a clear distinction is made between being inhabited by an unclean spirit and being sick. Demon possession could produce illness, but not all illness was attributed to the indwelling of evil spirits. Note the distinction that is drawn in the following passage. “And at even, when the sun did set, they brought unto him [Jesus] all that were sick, and them that were possessed with demons” (Mark 1:32). The double use of the definite article (tous), together with the conjunction, reveals that two distinct classes are under consideration—those who were merely sick, and those who were demon possessed and may or may not have had attending problems. Lenski has commented: “Two classes are markedly distinguished; those suffering from ordinary diseases and those possessed with demons. The distinction shows that the latter cannot be classed with the former in spite of modern attempts in that direction” (1964, p. 84). The New Testament clearly indicates that demons were under the control of divine authority. Jesus, for example, could command them to leave a person (Matthew 8:16), or even to keep quiet (Mark 1:34). The demons that tormented the man in the country of the Gerasenes could not enter the nearby swine herd except by the Lord’s concession (Mark 5:13-14). Since it is the case that demons could do nothing except by divine permission, the intriguing question is: Why did God allow these malevolent beings to enter into people? The truth of the matter is, the Bible does not give a specific answer to this question—as much as our curiosity wants to be fed. I believe, though, that a reasonable case can be built to help shed some light on the subject. If the mission of Jesus Christ, as the divine Son of God, was to be effective, the Lord’s absolute authority had to be established. No stone could be left unturned. Accordingly, we see the Savior demonstrating His authority in a variety of ways. (1) Christ exhibited power over diseases and physical ailments (Matthew 9:20-22; John 4:46-54; 9:1-41). (2) The Lord exerted His authority over material objects (Matthew 14:15-21; 17:24-27; John 2:1-11; 21:1-14). (3) Jesus showed that He could control the elements of nature (Matthew 8:23-27). (4) The Master even suspended the force of gravity with reference to His own body when He walked upon the waters of the Sea of Galilee (Matthew 14:22-23). (5) The Lord released certain ones who had been captured by death (Matthew 9:18-26; John 11:1-45). (6) Finally, it is not unreasonable to assume that, just as the Savior had displayed His marvelous power in all these realms, it likewise was appropriate that He be able to demonstrate His authority in the spirit sphere as well. Satan is not in full control! In fact, note this interesting passage. When the seventy disciples returned from an evangelistic trip (Luke 10:1), they joyfully proclaimed to Christ: “Lord, even the demons are subject to us in thy name.” Jesus responded: “I beheld Satan fallen as lightning from heaven” (Luke 10:17-18). The significance of that statement is this: the disciples’ power over demons, under the aegis of Christ’s name (authority), was but a preview of the ultimate and complete fall of the devil. One scholar has expressed the matter in the following way. Jesus viewed the triumph of these [disciples] as being symptomatic of ever so many other victories over Satan throughout the course of the new dispensation, triumphs accomplished through the work of thousands of other missionaries. He was looking far into the future (cf. Matt. 24:14). He saw the ultimate discomfiture of the ugly dragon and all his minions (Hendriksen, 1978, p. 581). Consider another reference. Christ said: “But if I by the Spirit of God cast out demons, then is the kingdom of God come upon you. Or how can one enter into the house of the strong man, and spoil his goods, except he first bind the strong man?, and then he will spoil his house” (Matthew 12:28-29; Luke 11:20-22). The Savior’s argument is: I have cast out demons, the servants of Satan. I could not have done so if I were not stronger than he is. My power thus is superior to his. These passages, I believe, help us to understand the purpose of demon possession in the first century. It established the comprehensive and supreme authority of the Son of God. Why demons entered particular individuals is not explained in the Scriptures. Unger speculated that “in the great majority of cases possession is doubtless traced to yielding voluntarily to temptation and to sin...” (1952, p. 95). However, in the instance of the epileptic boy, the lad had been tormented “from childhood” (Mark 9:21), which suggests, at the very least, that personal sin was not necessarily a causative factor in demon possession. The mute demoniac (Matthew 9:32-34). It is worthwhile to make this brief observation. The ancient world abounded with superstition relative to demons (where the genuine exists, the counterfeit will be as well). But there is a vast chasm between the accounts of demons in the New Testament and that of the pagan world and, in fact, even among some of the Hebrew nation. For instance, as mentioned earlier, there are no accounts in the New Testament of any visual descriptions of demons. Such characterizations, however, were common in the heathen world. A bronze statue from ancient Babylon contains the image of the demon Pazuzu. The figure has the wings and feet of an eagle, a human body with claws for hands, and a misshapen head (Aune, 1979, 1:920). Josephus tells of a demon expulsion whereby the exorcist “put a ring which had a root of one of those sorts mentioned by Solomon, to the nostrils of the demoniac, after which he drew out the demon through his nostrils...” (Antiquities 8.2.5). The New Testament contains no such absurd concoctions. Do evil spirits enter into human bodies and afflict people today? I confidently affirm they do not. Unfortunately, though, some modern writers have argued that demon activity is still a part of Earth’s environment. Charles Ryrie contended that certain “fallen angels” are “still free to roam the earth as demons carrying out Satan’s designs” (1959, p. 296). Merrill Unger, a respected scholar, subtitled his book, Biblical Demonology, “A Study of the Spiritual Forces Behind the Present World Unrest.” Several years ago a book titled UFOs, Satan and Evolution enjoyed a limited circulation in the evangelical community. Therein the author claimed that hundreds of UFO visits to Earth represented an invasion of demons. He cited one “example” where a demon raped a woman (an interesting feat for a spirit!). The fact that a prominent creationist wrote the Foreword for this literary fiasco remains an inexplicable mystery. The position that demon possession does not exist today can be argued from a twofold base. First, a thoughtful study of the details associated with the so-called modern examples of demon habitation reveals that these cases bear no resemblance to the genuine examples of spirit possession described in the New Testament. The contrast is dramatic. Second, a consideration of certain data set forth in the New Testament leads only to the conclusion that demon possession was a first-century experience; it was allowed for a very specific reason, and the divine concession was suspended near the end of the apostolic era. When the movie, The Exorcist (based upon William Blatty’s novel of the same name), made its appearance in December 1973, a wave of mystical excitement that has been dubbed “the exorcism frenzy,” swept the nation. (By the time the movie had been out for 5 weeks, Blatty’s book had sold 9 million copies.) Scores of people began to surmise that they were possessed of evil spirits—or that they knew someone else who was! Numerous articles regarding these alleged experiences appeared in mainline newspapers and magazines. A careful consideration of the details involved in these alleged episodes highlights some startling contrasts to the New Testament (cf. Woodward, 1974). Reflect upon the following differences. (1) The “exorcisms” of today are performed almost invariably in dark, secluded environments, only to be publicized later. When Jesus cast out demons, the episodes were public, and therefore subject to critical examination (cf. Luke 4:31-37). (2) The Lord could expel evil spirits with but a word, and the effect was immediate (Luke 4:36; Matthew 17:18). The Jesuit Priest who supposedly “exorcised” a demon from the youngster who served as the subject of Blatty’s book, The Exorcist, confessed that it took him two months of preparation (fasting on bread and water), and twenty ritual ceremonies to purge the child. (4) Modern demoniacs frequently are described as uttering “fierce curses” and “bursts of blasphemy.” In the New Testament record, demons always were very respectful of deity (Mark 1:24; 3:11). There is not a solitary case of a demon blaspheming either God or Christ in the biblical narratives. (5) Two cases of demon possession in the New Testament reveal that the unclean spirits could empower their hosts with supernatural strength (Mark 5:1-20; cf. Acts 19:13-16). The demoniac described in Mark 5 could not be bound even with a “chain.” A respected university professor posed this interesting query: “If we have demon-possessed people today, why in my travels in over forty countries of the world have I never seen a person who is so strong that you can’t bind him with chains (cf. Mk. 5:3)?” (Edwards, 1996, p. 135). (6) The ability to cast out demons in the first century was given in order to confirm the truth of the Gospel message (Mark 16:17-20). Modern “exorcists” preach everything but the Gospel. A powerful case can be made for the proposition that demon possession was not allowed to continue beyond the apostolic age—i.e., the era of miracles. I first must mention that when the prophet Zechariah foretold the coming of the Messianic dispensation, and the blessings that would accompany the spread of the Gospel, he suggested that the Lord would “cause the prophets and the unclean spirit to pass out of the land” (13:1-2). Some feel that the expression “unclean spirit” may hint of, or at least include, the cessation of demonic activity. Hailey sees this as a prediction of the eventual termination of prophetic activity (on the part of God’s people) and the curtailing of the power of unclean spirits. Likewise, unclean spirits, the antithesis of the prophets, would cease. In the conquest of Christ over Satan and his forces, unclean spirits have ceased to control men as they did in the time of the ministry of Christ and the apostles... (1972, p. 392). While this is not a common view of Zechariah’s prophecy, and certainly not one upon which an entire case could be built, it is not without possibility. A firmer proposition can be argued as follows. (1) Nothing duplicating the miracles of the first century is apparent today. No one can walk upon water, raise the dead, calm a raging storm, turn water into wine, instantly heal an amputated ear, extract tax money from a fish’s mouth, etc. Miracles are self-authenticating phenomena that cannot be denied, even by hostile critics (cf. John 11:47; Acts 4:14-16); clearly, they are not occurring today. (2) The purpose of supernatural gifts was to confirm the authenticity of divine revelation being received from heaven (Mark 16:9-20; Hebrews 2:1-4). Since the revelatory process was completed when the last New Testament book was written, miracles no longer are needed, hence, have ceased. They were like the scaffolding that is removed once the building is finished. (3) The New Testament explicitly argues that the day was on the horizon when miracles would cease. Paul defended that position both in Ephesians 4:8-16 and in 1 Corinthians 13:8-10. During the early days of the apostolic era, divine revelation had been “in part,” i.e., piece-by-piece. The apostle said, however, that when “the perfect” or “the complete” arrived, the partial revelation, which came by means of the various “gifts” (e.g., supernatural knowledge and prophecy), would cease (1 Corinthians 13:8ff.). Prominent Greek scholar, W.E. Vine, summarized the matter well. With the completion of Apostolic testimony and the completion of the Scriptures of truth (“the faith once for all delivered to the saints”, Jude, 3, R.V. ), “that which is perfect” had come, and the temporary gifts were done away. For the Scriptures provided by the Spirit of God were “perfect”. Nothing was to be added to them, nothing taken from them. This interpretation is in keeping with the context (1951, p. 184). Elsewhere this writer has discussed the theme of miracles and their duration in much greater detail (Jackson, 1990, pp. 114-124). Here is a crucial point. If it is the case that miraculous powers have been removed from the church’s possession, including the ability to cast out demons (Mark 16:17-20), does it stand to reason that God would allow demons to supernaturally assault people today, thus granting Satan an undue advantage over the human family? How would this square with the promise that “greater is he that is in you than he that is in the world” (1 John 4:4)? In other words, if the gift of expelling demons no longer is extant, is it not a reasonable conclusion that demon possession is obsolete as well? Certainly Satan exerts great influence today. However, as God does not work miraculously in this age, but influences through his Word and through the events of providence, so also, the devil wields his power indirectly, and non-miraculously, through various media. Current cases that are being associated with demon possession doubtless are the results of psychosomatic problems, hysteria, self-induced hypnosis, deception, delusion, and the like. They have natural, though perhaps not always well understood, causes. Arndt, William F. and F. Wilbur Gingrich (1967), A Greek-English Lexicon of the New Testament (Chicago, IL: University of Chicago). Aune, D.E. (1979), “Demonology,” International Standard Bible Encyclopedia ed. Geoffrey Bromiley (Grand Rapids, MI: Eerdmans), revised edition. Barclay, William (1976), And He Had Compassion—The Healing Miracles of Jesus (Valley Forge, PA: Judson Press). Campbell, Alexander (no date. ), Popular Lectures and Addresses (Nashville, TN: Harbinger Book Club). Edwards, Earl (1996), “Powers of Darkness—Demon Possession,” Settled in Heaven, ed. David Lipe (Henderson, TN: Freed-Hardeman University). Fields, Weston W. (1976), Unformed and Unfilled (Nutley, NJ: Presbyterian & Reformed). Greenleaf, Simon (1903 edition), The Testimony of the Evangelists Examined by the Rules of Evidence Administered in Courts of Justice (Newark, NJ: Soney & Sage). Hendriksen, William (1978), An Exposition of the Gospel of Luke (Grand Rapids, MI: Baker). Hodge, Charles (1960 edition), Systematic Theology (London: James Clarke). Jackson, Wayne (1990), “Miracles,” Giving a Reason for Our Hope, ed. Winford Claiborne, (Henderson, TN: Freed-Hardeman College). Jackson, Wayne (1996), “The Silence of the Scriptures: An Argument for Inspiration,” Reason & Revelation, 16:17-22, March. Kaiser, Walter C., Jr. (1992), More Hard Sayings of the Old Testament (Downers Grove, IL: InterVarsity Press). Lenski, R.C.H. (1964), The Interpretation of Mark’s Gospel (Minneapolis, MN: Augsburg). McClintock, John and James Strong, eds. (1968 reprint), Cyclopedia of Biblical, Theological, and Ecclesiastical Literature (Grand Rapids, MI: Baker). Reese, David G. (1992), “Demons,” The Anchor Bible Dictionary, ed. David Noel Freedman, (New York: Doubleday). Ryrie, Charles C. (1959), Biblical Theology of the New Testament (Chicago, IL: Moody). Thayer, J.H. (1958 edition), A Greek-English Lexicon of the New Testament (Edinburgh, Scotland: T. & T. Clark). Unger, Merrill F. (1952), Biblical Demonology (Wheaton, IL: Scripture Press). Vincent, Marvin (1972 edition), Word Studies in the New Testament (Wilmington, DE: Associated Publishers and Authors). Vine, W.E. (1951), First Corinthians—Local Church Problems (Grand Rapids, MI: Zondervan). Vine, W.E. (1991), Amplified Expository Dictionary of New Testament Words (Iowa Falls, IA: World Bible Publishers). Woodward, Kenneth L. (1974), “The Exorcism Frenzy,” Newsweek, 83:60-66.